IPOB: NSUKKA COMMUNITY IN GRAVE DANGER AS BOKO-HARAM TERRORISTS NOW CONTROLLING THE BUSHES. News coming from a right source to the desk of family writers now clearly stated that Boko-Haram terrorists with sophisticated weapons are now parading in all the bushes in Nsukka community of Biafra Land, this information came from an eye witness who was kidnapped by the same terrorists and was later released with the ransom of N800,000. 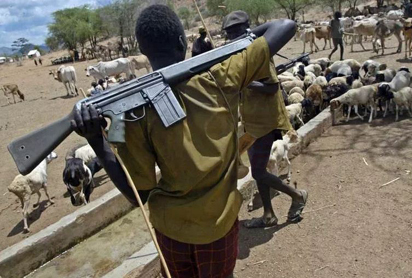 With this sad and disturbing development in the village, all the farmers and villagers are now in critical fear as their lives are at stake because of the invasion by these dangerous terrorists/Fulani Herdsmen. According to the eye witness, he stated that they are many of them with different divisions including their female agents parading in the bush as cattle rearers with no single cow with them. This combined terrorists clampdown in Nsukka community proves that there is insecurity in Enugu state and most especially in Nsukka community where the Governor of the state comes from and yet nothing has been done so far to secure the innocent people of Nsukka. You see, this people claim and pretend to be cattle rearers while they are really foxes in sheep clothing. Therefore, Enugu state youths are expected to protect and defend their land by every means possible since the governor of the state is mute with all the atrocities been committed by this murderous terrorists/Fulani Herdsmen. We therefore call for a thorough investigation by appropriate agencies in order to fish out these evil perpetrators, bring them to justice and forestall law/Order. The repeated heinous act of attacks and invasion are crimes against the citizenry of Nsukka and the perpetrators are therefore terrorists and must be treated accordingly. The commissioner of police, Enugu state has debunked the news, likewise the inspector general of police has also debunked the insinuations over being blamed. We must thus be cautious of packaging crimes on religious and ethnic garments. Crimes are abominable and whoever commits them is set to be dealt with accordingly. So, this is a wakeup call to all the Biafrans in Biafra land and Biafran security operatives serving in Nigeria to be security cautious, they should brace up in being proactive and utilize maximally intelligence reports like this, in order to nip-in the board possible eruptions of security problems within and around communities in Biafra land.